Regional Championship game on March 22 in San Antonio. The unfolding of this story began a generation earlier with the stoking of passion for Gopher basketball and Williams Arena. The exact moment of the story’s beginning I was an April 1971 conversation at our family home on Minnehaha Circle in St. Louis Park, a basketball-loving community. Visiting was CJ Ahlstrand on a Friday night to discuss with my dad (two of the coaches of the Dutch Boy team in Park Central Little League) the upcoming season, which was to begin Saturday with its opening day. CJ was a Gopher basketball season ticketholder (as was our family — there were only a few thousand in those days) and followed the team closely. CJ told us the newly hired Gopher basketball coach, Bill Musselman, was young, energetic and talented and would bring winning basketball back to the “U.” He then invited my parents to join him and his wife for a December trip with the Gopher basketball team to the Rainbow Classic in Honolulu. And to my great excitement, my parents decided to take the trip. The prospect of my parents’ tropical expedition across the Pacific to watch the Gophers play basketball (my dad had taken me to my first game in 1970) was near stimulus overload for me, a second-grader at Park Knoll Elementary. Second grade became third grade in Miss Cain’s class in the fall of 1971 and my sixth-grade brother (on the second floor of Park Knoll) and I were now obsessive about Gopher basketball with the season approaching. We persuaded our mom to take us to Town Drug in the Texa Tonka shopping center so we could see the Sports Illustrated college basketball edition (our subscription copy would not arrive until Friday) on the Wednesday before Thanksgiving. We tore into the store, ran to the magazine rack and paged breathlessly through the pages until we let out a triumphant yell when we saw Minnesota was ranked 20th in the country behind its center Jim Brewer and Steve McQueen dead-ringer coach, Bill Musselman. When my parents and the Ahlstrands and the rest of the booster trip returned, we soaked up all of the details of the trip. There were the players with whom they became friendly: Corky Taylor, Clyde Turner and Greg Troland and assistant coach Jimmy Williams. There was the Rainbow Classic program autographed by the entire team including Dave “the Rave” Winfield, Ron Behagen, Bob Nix and Keith Young. A few days later the 1972 Big Ten season opened with Minnesota beating Indiana 52-51 before 19,000 fans at Williams Arena, igniting an interest in Gopher basketball that burned red hot in Minnesota most years through 1999. The 1972 Big Ten season — chronicled in many places over the years — was a season of trauma (the Ohio State fight for which the Gophers were significantly but not exclusively culpable) and euphoria (the “Iron Five” winning Minnesota’s first Big Ten championship since 1971). My brother and I followed every twist and turn of the season and debated its consequences. It culminated with a Saturday afternoon game against Illinois. Minnesota was winning comfortably when Williams Arena announcer Julie Perlt announced the final score of the Michigan-Michigan State game. (The Gophers needed the Spartans to beat the Wolverines.). “Final Score from East Lansing: Michigan 92 Michigan State 96.” The noise of the pandemonium made the hanging lights sway from the ceiling. Minnesota had clinched a tie for the Big Ten Championship — its first since 1937. The next 25 years brought Jim Dutcher (1982 Big Ten Championship) and Clem Haskins (“Sweet 16” and “Elite 8” in 1989 and 1990) as successors to Bill Musselman. The overall trend line was mixed with a series of NBA first round draft picks; off-court behavioral issues; periodic NCAA investigations — Minnesota providing a convenient target as a Big Ten school that was not a blue-blood basketball power; and several NCAA tournament near misses (1973, 1983, 1993 and 1996.). Despite the highs and the lows from 1973 to 1996, the fan base remained resilient as it was rewarded with the play of some very talented teams and the joy of attending games at Williams Arena with its remarkable configuration and atmosphere. For 1996-1997, Clem Haskins made a characteristically bold prediction that his team would compete for the Big Ten championship. He was right: The team rolled to a 16-2 Big Ten championship season; a national ranking as high as number 2; and the first seed in the Mideast region for the 1997 NCAA tournament. The team was Big Ten strong in the front court (John Thomas, Courtney James and Trevor Winter) but could play all 90 feet with talented and athletic wing and guard play (Eric Harris, Charles Thomas, Sam Jacobson and Quincy Lewis). Swingman Bobby Jackson was the capstone, giving Minnesota its greatest clutch player making game winning plays down the stretch of the toughest games. This Gopher basketball team captured Minnesota’s attention in that cold and snowy winter and gradually the nation’s as it ascended the sports writers’ and basketball coaches’ Top 25 polling. Two NCAA tournament wins in Kansas City (Southwest Texas State and Temple) brought Minnesota to San Antonio for the region semi-final and final games. Thousands of Gopher fans made the trip to the Alamodome and witnessed two of the most memorable and arresting games in Minnesota basketball history — a double overtime win against Clemson in which Bobby Jackson willed the team to victory, and a comeback win against UCLA where the Gopher post players dominated the second half in the paint. The team — now 31-3 — was welcomed back by 15,000 celebrating fans at the largest party in the history of Williams Arena as a prelude to the trip to Indianapolis for the 1997 Final Four. My brother Craig and I had the pleasure of watching the games together as we were visiting Los Angeles with our 6-week-old daughter born 20 days after their youngest daughter. Minnesota was playing in the national spotlight with tens of millions of people watching and completing their brackets — in the waning days of the pre-on-line world. This last point is relevant because we woke up the Saturday morning of the Mideast regional final to the Los Angeles Times sports section filled with stories about the upcoming Minnesota-UCLA game. Our Minnesota eyes and ears steamed with Ski U Mah righteous anger. Then our emotions turned to resolve. We were raised to find a way to punish UCLA for its West Coast haughtiness. How do we get this mother-of-all bulletin board material into the hands of the Gopher basketball team with its 6’10” and 7′ centers and 6’8 power forward? We could see Minnesota mentally breaking Westwood and Santa Monica surfboards as they read these incendiary quotes. Next I called Roger Schipper in his San Antonio hotel room. I read him the quotes. “Get me the story,” he said. The answer was the fax machine at the Kinko’s in Westwood — deliciously on campus at UCLA. Working furtively, we photocopied the story and faxed it to Roger. Remarkably, even the outcome of the game could not convince the West Coasters the better team had won. 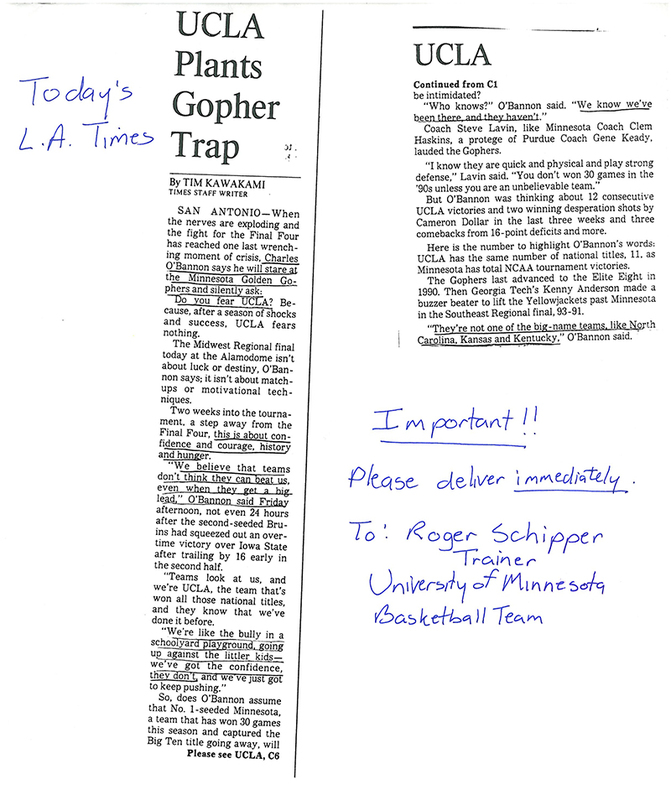 After remarking about the Ed O’Bannon quotes — and the uses to which they were made by the Gophers, in his post-game March 23, 1997, Los Angeles Times column, Bill Plaschke could not resist one final dig at the Gopher basketball team: “The Gophers were slower, less athletic, more tentative. But they were smart enough to take advantage of McCoy’s absence.” And they were sufficiently reserved to keep their pregame view of their opponent to themselves. So, that was how we — raised in basketball loving St. Louis Park and turned on to Gopher basketball by Bill Musselman — played some small role in helping Minnesota beat mighty UCLA to win the Mideast regional and a berth in the 1997 Final Four. The fact that the team had four future first round NBA draft choices might also have played a role in the Minnesota victory. Of course, time can make a shamble of triumph. Within two years, Jan Ganglehoff would emerge and — among other consequences — the entire 1996-1997 season was vacated, belonging now only to our memories. Oh, yes, the Gophers played a solid game losing to Kentucky in the 1997 national semi-finals — even leading briefly with about 10 minutes to play before succumbing to the Wildcats’ full court press. And the Kentucky coach? It was Rick Pitino, father of current Gopher coach Richard Pitino as the Pitinos become the first father and son combination to coach different teams in the same NCAA men’s basketball tournament. Steve Hunegs is the executive director of the Jewish Community Relations Council of Minnesota and the Dakotas. Submitted by Peggy Reinhardt on 04/03/2017 - 11:12 am. I hope this makes the annals of Best Sports Writing of 2016. RIP Jan Gangelhoff. She was an admin in the School of Public Health when I was a student there in the early ’90s. She was excited and happy in her new job, but none of us can imagine the pressure she must have felt to assist a winning team that was failing academically. Thanks for that memory too.